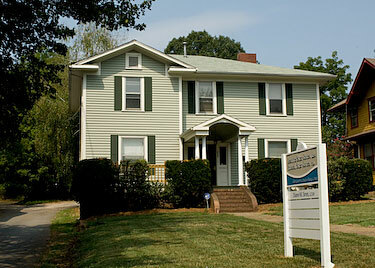 The Odessa Wellness office is located in this lovely home. Just drive down the left side of the house and park in the lot behind the house where you will find the entrance to the office. Take Exit 50, the Hwy. 25, Hendersonville Road exit, and go north on Hendersonville Road towards Biltmore Village. Go .4 miles (downhill) to Biltmore Village (the second stop light from I-40). VEER LEFT, towards the Biltmore Estate, staying on Hwy 25 over the bridge. Go 1.6 miles (you will pass Asheville High School on the left, go through the tunnel, and down the hill) to a stop light. TURN LEFT onto Phifer Street. (If you turn right, it’s Southside.) Go 0.2 miles. TURN RIGHT onto South French Broad Avenue. 239 is the 3rd house on the left. Travel South on US 19/23, towards Asheville. At the 19/23 – 240 interchange, take the I-240-East exit, keep LEFT at the fork, towards Patton Avenue and Downtown. Go 0.4 miles on Patton Avenue, towards downtown Asheville. TURN RIGHT onto South French Broad Avenue. Go 0.6 miles, crossing Hilliard Avenue, passing the YWCA and Asheville Middle School on the right. 239 is the 3rd house on the right past Asheville Middle School. Take I-240 East. Cross the Smoky Park Bridge. Exit right towards Downtown, onto Patton Avenue. Go 0.4 miles on Patton Avenue. Take I-240 West, past the Charlotte Street and Merrimon Avenue exits. EXIT RIGHT at the Montford Avenue exit. TURN LEFT at the top of the exit ramp onto Montford Avenue. Cross over 240. TURN LEFT at the stop light, onto Haywood Street. Go 50 yards. TURN RIGHT onto North French Broad Avenue. Go 0.9 miles, crossing Patton Avenue (where North French Broad becomes South French Broad) and Hilliard Avenue, passing the YWCA and Asheville Middle School on the right. 239 is the 3rd house on the right past Asheville Middle School. "Judy McClung not only helped us with a child with behavior problems, she also helped us to become better teachers and parents." "Judy McClung's parenting class provided a great step forward for me as a parent. Non Violent Communication and Love and Logic are great tools for any parent's toolbox, but it was most helpful to role play and practice together with other parents. I appreciated her thoughtful challenges and sensitive encouragement. It really helps when both parents are on the same page. Thanks Judy!!" “I am so fortunate to have Judy in my life; she is a great therapist who is devoted and compassionate. I feel comfortable when talking with Judy, she understands and “gets me.” She has a real connection to the mind, body and spirit as well as understanding behavior, communication and social adaptation of individuals. She has helped me to discover the interpretations behind my thoughts, feelings and actions and has taught me how to develop these traits to live and enjoy a more prosperous and happy life. I am so thankful for her guidance!"